The Hazel Wood caught my eye months ago, back when I first read the synopsis on Goodreads. I scrambled to trade for it as soon as possible... and it sat on my shelf for months before I finally worked up to reading it. The hype was strong and unfortunately it just didn't live up to it, mostly because, as I'll explain more, this fantasy novel doesn't contain much fantasy. Alice is the MC of this story and she is... not that great, to be honest. I wanted to sympathize with Alice. She's had a rough backstory and her mom has been stolen away. She just isn't very sympathetic. Alice is a bit rude to everyone around her, including people who are trying to do everything they can to help. Finch, for example. I really loved Finch and thought he was a great side character and not-fully-realized love interest. You read that right! There isn't a lot of romance in The Hazel Wood, which could be either a pro or a con, depending on your preference. Personally, I would've preferred a bit more of a fleshed out relationship between Finch and Alice, even if it wasn't fully romantic. As the story was told, their interaction kind of just made me dislike Alice more. There are tons of other super interesting characters in The Hazel Wood, but none of them are around for long enough to get to know. I really wished we could've learned more about the crazy fan who finally made it to the Wood or even some of the creepier, more fantasy-ish characters. Honestly, I'd have settled for more about Alice's elusive grandmother! Likewise, the world building was fantastic! Once we got to The Hazel Wood, that is. Up until then, I guess it was okay? But it was just a normal city. I didn't feel particularly creeped out, which is how a lot of people have said this book made them feel. When the fantasy finally happened, it was great! I loved how uneasy I felt about the Wood and Althea's house and everything that came after. I loved the Hinterland and the Stories and every.single.thing. There just wasn't enough to love. My other issue with The Hazel Wood was with the pacing, and honestly that probably ties back into the lack of fantasy. I don't read contemporary books because they bore me out of my mind, which is exactly how I felt with this. It took me forever to read because I could barely slug through each chapter... until they got to the Wood - I know I must sound like a broken record! A lot did happen, but I didn't feel any real sense of urgency or danger that kept me turning the pages. I've heard that there will be another book in this series (was this originally planned?) and I honestly have no idea where the author could possibly take it. If it's back to the Wood, I may give it a chance! 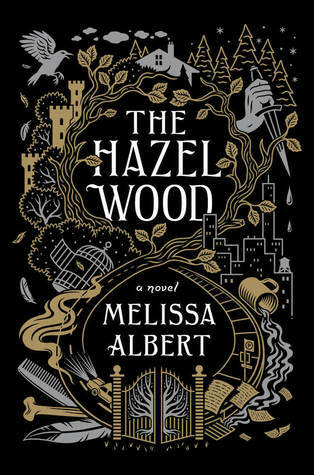 Melissa Albert does know how to craft a good fairy tale, as evidenced by last chunk of this book and I would love to read anything she writes in the future if it's actually fantasy. Unfortunately, this just... isn't. If you enjoy contemporary AND fantasy, this is probably a book you will love! But if, like me, you can't stand contemporary fiction, you may want to steer clear.